INVICTA OVE REVIEW - GREAT STOVE WITH A COUPLE OF DRAWBACKS. We've owned our Invicta Ove for three years now, and it has been in daily use each winter. It's obviously a unique and beautiful design, which we love and which always attracts favorable comments from visitors. The flue rises almost seamlessly straight from the top of the stove, and it would be a real shame to introduce any bends which would spoil that elegance. The build quality is excellent, heavy and accurate castings throughout, and the door mechanism works well. The door handle stays cool. Very nice finish to the castings. It chucks out a lot of heat as it's rated at 10kw nominal and is definitely not a stove for a small room. It warms up quite quickly, and runs on a reasonably modest amount of firewood given the high output. The firebox is quite big, and you can stand long logs vertically if you want to, so long log is no problem. It definitely runs better on a good bed of ash, if you clean it out completely, too much air comes from beneath the grate and it burns too high. The only fault (almost) with this stove is the poor airwash. We have a lifetime's experience with woodburners and know only too well how important it is to burn only dry wood, and to open up the fire to get it really hot from time to time. However, the glass tends to soot up each day to the point where you can hardly see the flames, and we find we need to do a daily clean (using a damp cloth and wood ash) before relighting it, which is a bit of a pain. I think this is probably because it has such a tall firedoor (with the secondary air inlet at the top), and the airwash struggles to reach the lower half of the glass. The only way to prevent this seems to be by running it on high fire most of the time, but then you get far too much heat and use too much fuel. There doesn't seem to be anything you can do about this, and we like the stove so much that we just live with the inconvenience of a daily glass clean, but we wish we didn't need to. The designers of this stove have obviously worked hard to keep the design clean and elegant, and we feel that the primary and secondary air controls suffer slightly as a result. The primary air control is a notched wheel, which gets very hot and therefore needs a glove to turn it; also it does become stiffer and harder to turn with time. The secondary air control is situated at the top behind the door, and therefore you need to open the door to operate it, although to be fair you should really just leave this control open most of the time. We have modified both controls with small extension levers which can be operated quickly and easily with your bare fingers, and don't compromise the design. This is definitely something Invicta should look at improving. So, to sum up, a great stove but with a couple of drawbacks. We would probably still buy it again. Stove expert replied: Good solid review and with a minor change it could be improved to be able to enjoy the flame picture continuously. 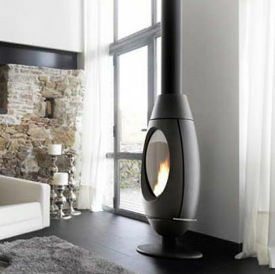 A great looking stove though!